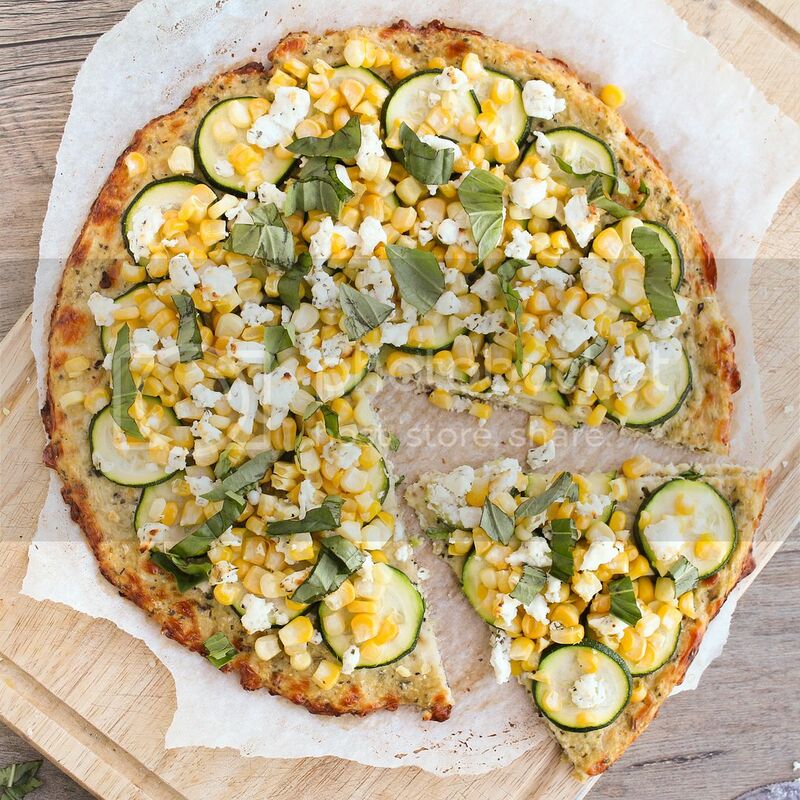 If you have no idea what I'm even talking about when I refer to cauliflower crust pizza, I'll give a quick explanation of what it is. 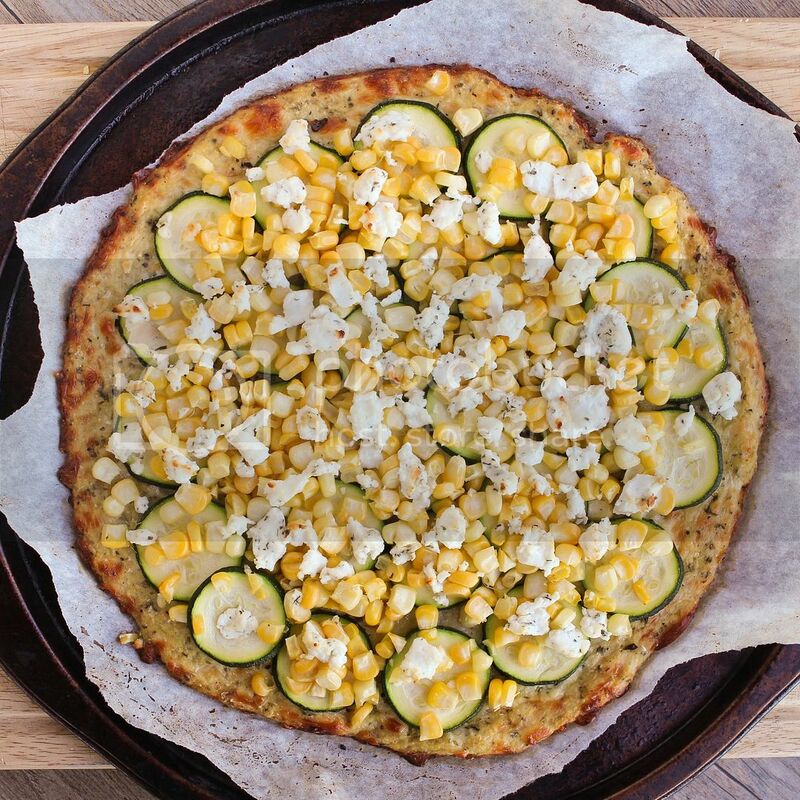 Basically it's a breadless pizza crust that's made by mixing pulverized cauliflower with cheese, egg, and spices (if you like) to form a "crust" that is then baked and topped with any pizza toppings you like. So it's healthier than pizza in the sense that there is actually some nutrition in the crust instead of empty carbs, but I should be clear that it's also not some sort of miracle calorie-free pizza because there is a lot of cheese in the crust, if that's what you're concerned about! There are lots of different recipes for cauliflower crust floating around, but I used one from The Lucky Penny Blog (with a few small changes), which Jessica from How Sweet It Is recently affirmed is the best cauliflower crust pizza recipe around, and though I haven't tried any other versions, this one worked so well that I know I won't need to (though she does have a cheese-free version if you're interested in trying it)! You then cook the "crumbs" in the microwave, let them cool, then transfer them to a towel to wring out all the water. This is probably the most important step, as it will help make sure your crust stays together later. You'll be surprised at how much water comes out - and you'll get a bit of an arm workout during the process! 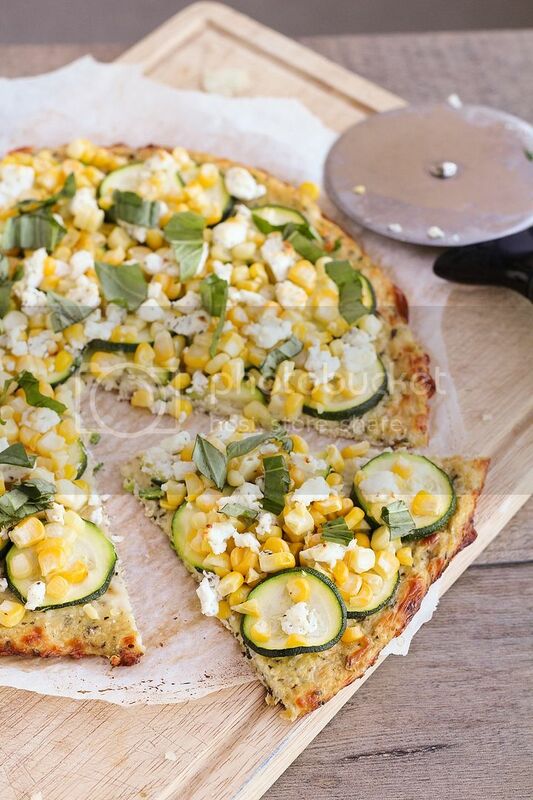 You'll need to prebake your crust, during which time you can get all your toppings ready, then return the pizza to the oven with the toppings, wait very impatiently for it to be ready, and eat! 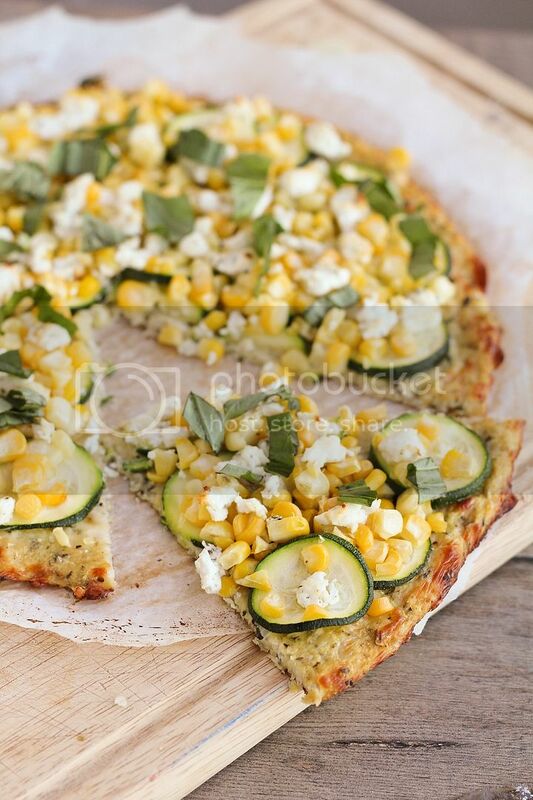 I decided to keep my toppings light and summery with corn, zucchini, and basil. Even though the air is definitely getting chillier around here, it's still summer and there's still lots of corn and zucchini available! I didn't use a sauce or cheese except for the goat cheese on top, as there's already cheese in the crust and I didn't want this to be too heavy. Everything worked so well together and tasted fresh, which I loved! The crust was also way better than I expected! It definitely doesn't taste anything like traditional pizza crust, so if that's what you're expecting then you'll be sadly disappointed. 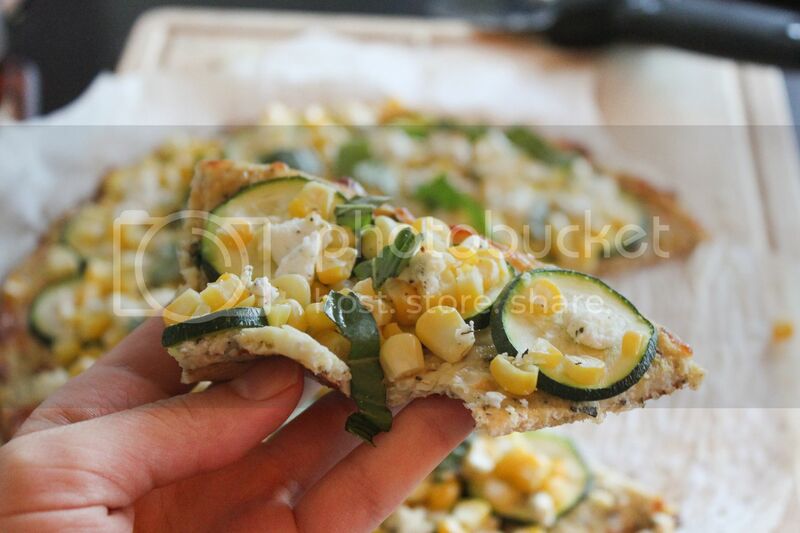 Instead, it's chewy and flavourful and cheesy, and I think I actually might like it even better than regular crust! Not that this will be replacing regular pizza for me as there's definitely still a time and place for that, but it's nice to have an alternative! Chop the cauliflower into florets (try to remove the stems). 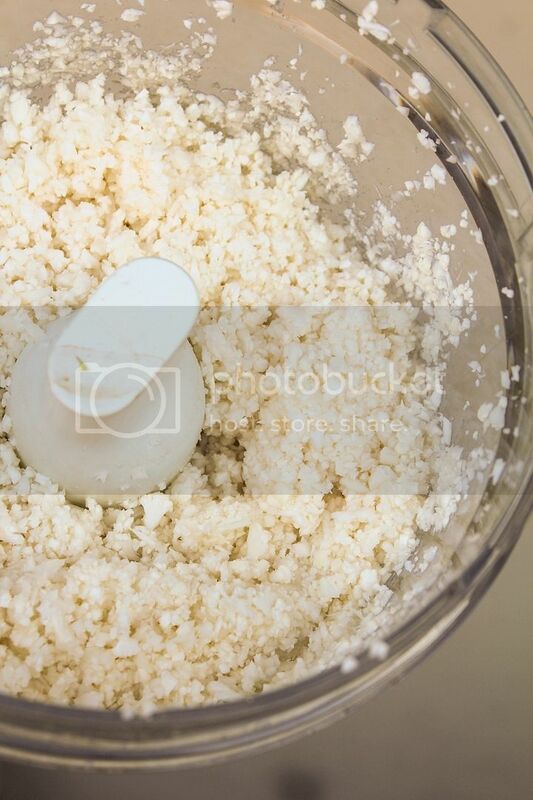 Place in the large bowl of a food processor and pulse for about 30 seconds, just until all of the florets have been pulsed into very fine crumbs. You should have about 3 cups of crumbs. Transfer to a microwave safe bowl, cover, and microwave on high for 4 minutes. Remove and let cool slightly. 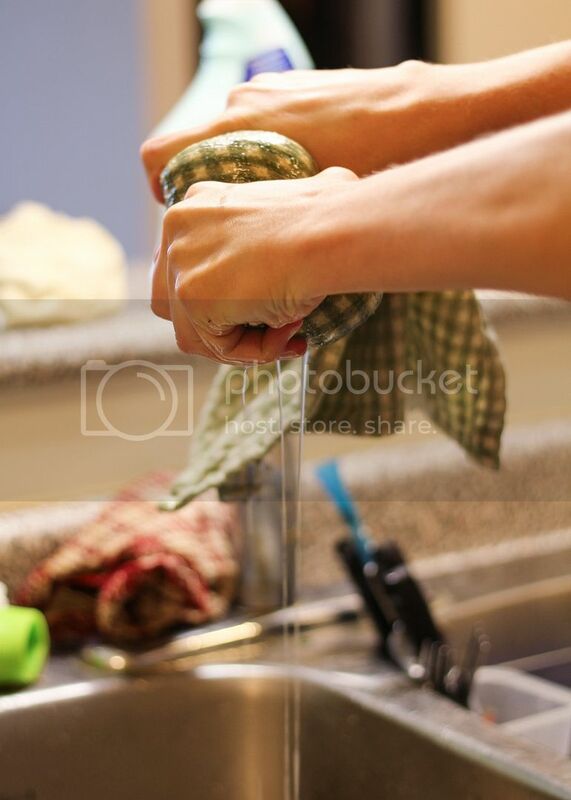 Transfer to a clean tea towel (don’t use paper towels - they will shred), wrap up tightly in the towel, and wring all the water out of the cauliflower over the sink. You will be surprised at how much water comes out! Keep wringing to get as much water out of the cauliflower as you can – this will prevent the crust from crumbling. 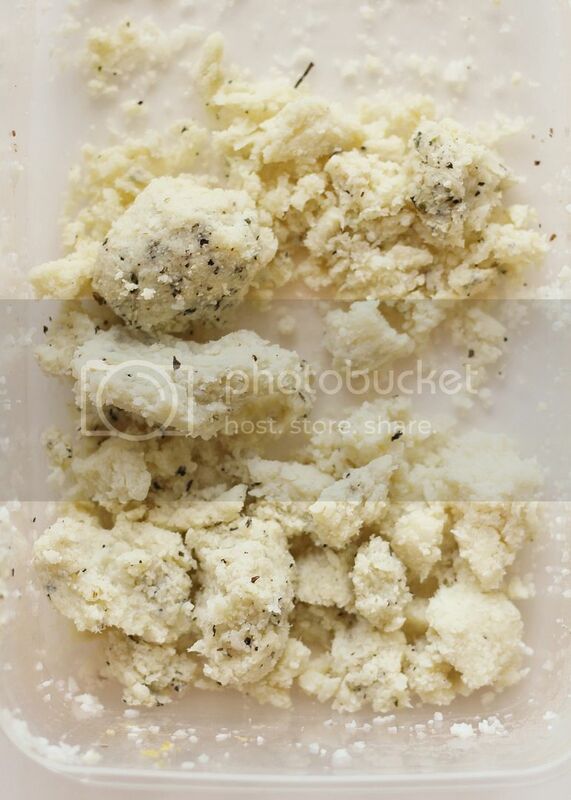 Combine dried cauliflower with the cheese, basil, oregano, salt, pepper, nutritional yeast, and egg. Mix to combine (I just used my hands). 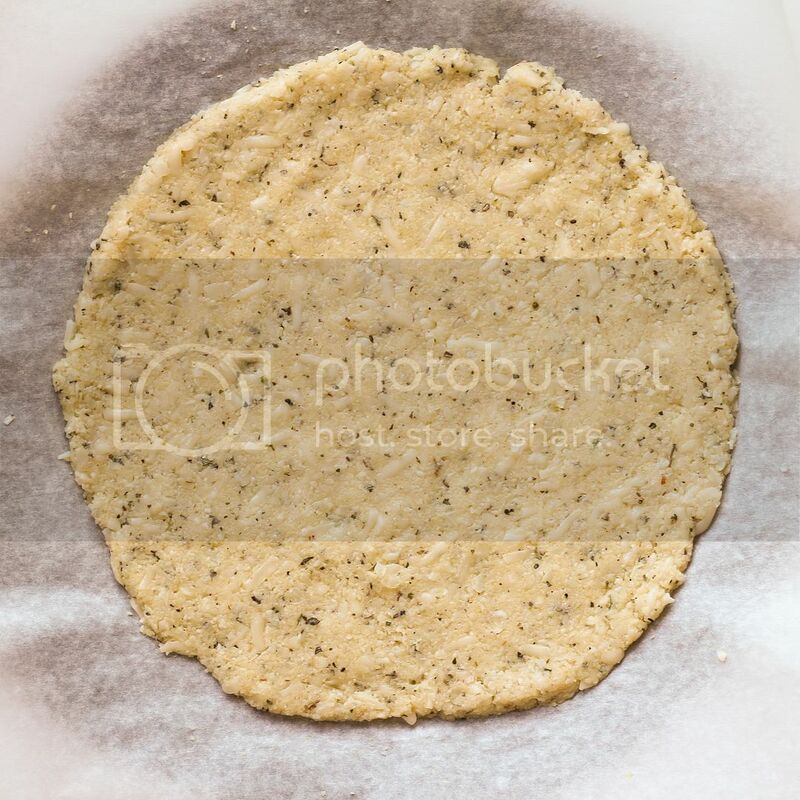 Transfer to prepared baking sheet and form into a 10” thin circle. Bake in preheated oven for 10-11 minutes. 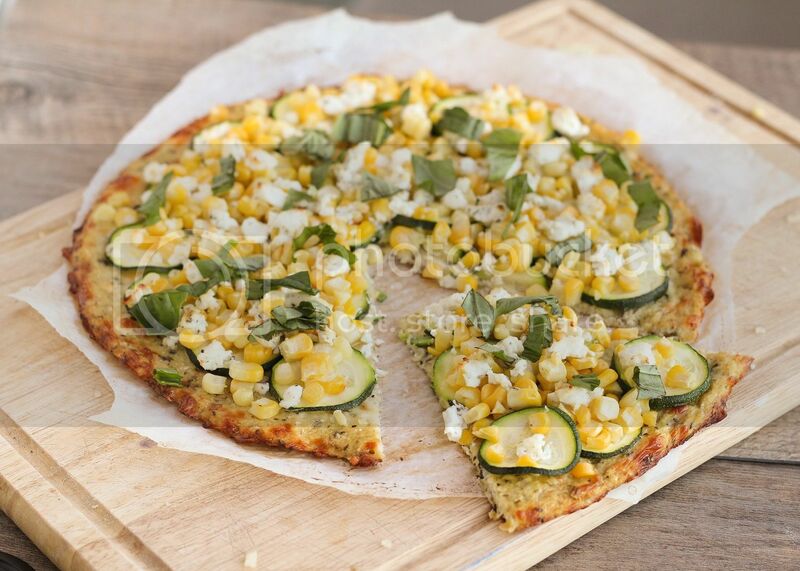 Once crust has precooked, remove from oven and top with zucchini, corn, and goat cheese (you might not be able to fit all of the zucchini or corn kernels, depending on how big the zucchini and ear of corn were). Top with crumbled goat cheese. Return to oven and bake for another 15-20 minutes. Remove from oven, top with sliced basil, season with additional pepper if desired, and serve! Note that this is best eaten fresh - it doesn't keep very well.